Home » Uri Geller’s legend about John Lennon and the “alien egg”: fact or fiction? Uri Geller’s legend about John Lennon and the “alien egg”: fact or fiction? If you were old enough to watch TV in the 70’s then you remember the world renowned psychic and magician Uri Geller, who bent spoons with his mind for the entertainment of audiences all over the world. Here is a story about Geller and John Lennon that fits in with the Halloween theme this weekend of ghosts, witches, aliens and magic. Uri Geller says he believes he is on a mission to prepare the world for the formal appearance on earth of extraterrestrial life forms (he’s from a planet named Hoova). Geller met Lennon and May Pang at Elton John’s Madison Square Garden show in 1974, and has a whopper of a story: that Lennon later told him he was visited by aliens who gave him a magical egg. This is the subject of this article. That perspective alone makes this story—a little too “out there” for my taste, and probably yours—-but because Geller’s claims are quite fantastic and readily available on-line in detail, I decided it was time to do some follow up to see if there was any truth whatsoever to the story. According to this website, Geller’s story ran in December of 2004 in the London Telegraph, and it has appeared in other publications as well. He currently writes columns for a number of major new outlets, such as the London Times, the Weekly News, the Mirror and the Jewish Telegraph. After reading the story I contacted May Pang, as she was still close friends with Lennon in 1975; so if this happened, John would have certainly told her. From her interview we discovered that it wasn’t just the egg story that was questionable, but Uri’s memory of the night he met John as well. I also interviewed Steve Roseta, a former magician himself who had very interesting and surprising knowledge of the magical egg and its origins. He said, “…About six months ago, I was asleep in my bed, with Yoko, at home, in the Dakota Building. And suddenly… there was this blazing light round the door… I leapt out of bed..and pulled open the door. There were these four people out there. “When we first met on November 28, 1974, he was suffering terribly from his separation from Yoko. His drug abuse and drinking, linked to the sorrow of Yoko’s recent miscarriage, had driven them apart, and John desperately wanted to mend the relationship. He just didn’t know how to make the first move. The night Lennon and I were introduced, Elton John was playing at Madison Square Gardens. Elton was trying to persuade the ex-Beatle to get up on stage with him, and John was torn — he wanted to perform but he was scared. May Pang recalls the details of the night of November 28, 1974 and the meeting of Uri Geller very vividly. As you’ll see, they vary significantly from Uri Geller’s recollections. Steve wrote me over email and said “I have something to show you. I think it will answer your question about where the alien egg came from.” Meeting at Tully’s Coffee he put a little a box on the table and opened it. 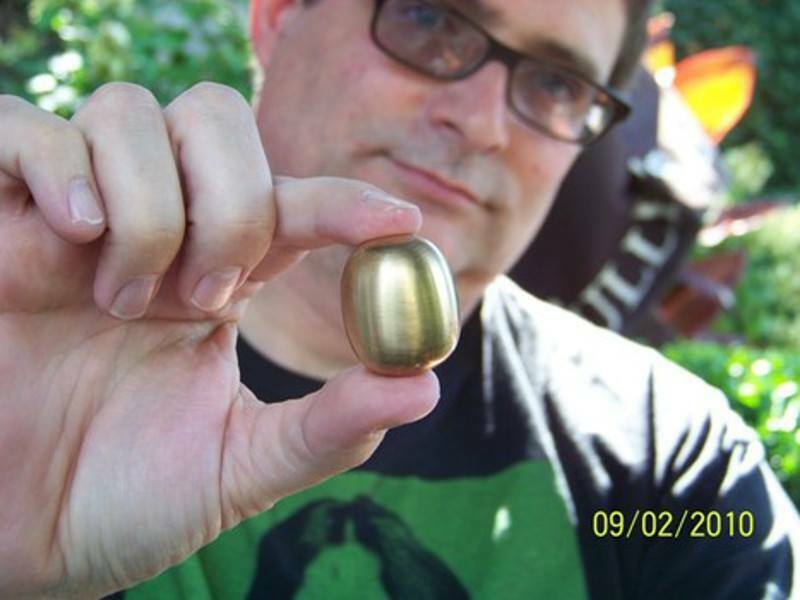 Inside was…..a small, smooth, golden egg, exactly like the one that Uri Geller is holding up in this picture, the one he claims John Lennon gave him in 1975! In conclusion, I’m always up for a good story about the paranormal. But the story of Lennon and the “alien egg” is definitely fiction. Maybe Uri made the whole thing up. Or maybe Lennon pulled one over on Geller. John loved pranks. (Even Geller admitted above that John had a sardonic humor and liked jokes.) How funny is it that the purported “aliens” happened to be “four bug people” (i.e. Beatles?) Gimme a break. Perhaps John found one of these eggs in a magic shop and decided to concoct a story that only Uri Geller would believe.